As reported on Wednesday in the Sheepshead Bites blog, a flyer distributed by supporters of the Ben Akselrod Sheepshead Bay (Brooklyn, New York) district primary campaign contained this horrendous and embarrassing typo. I cannot believe that this was not done deliberately. How could anyone not notice it? I think there may be clues as to the author's lack of care in the rest of the flyer. I see Mr Akselrod wants to 'creat' jobs. Also, in and amongst the unnecessary capital letters in the quote, you'll see that he cares so little he can't even get the name of the district right. 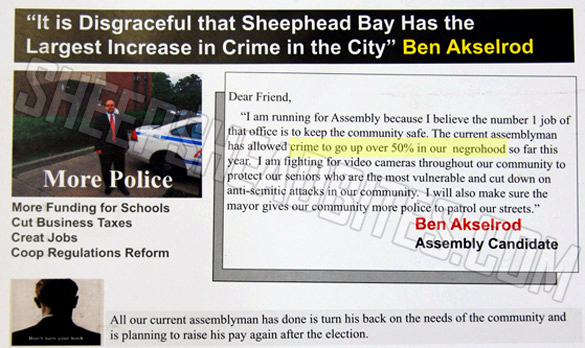 It's Sheepshead, Ben. Not Sheephead. I would imagine that quite a few people are calling you some other type of head right now.